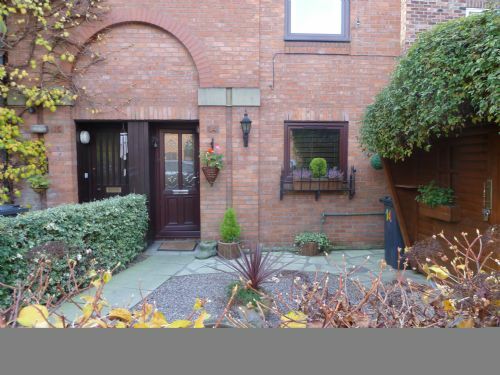 14 Cloisters Walk is tucked away in a quiet cul de sac near Monk Bar. This comfortable accommodation is convenient for the many attractions on offer in York. Everything about Cloisters Walk was excellent, from the friendly welcome from Dawn to all the nice touches round the house. As everyone says, the welcome hamper is outstanding: freshly made cake, cream, fresh fruit, biscuits, two loaves of bread... more than enough to keep you in light breakfasts and snacks for your short stay in York. The location is fab too, a short walk takes you straight into the centre. One small criticism, the television could do with an update. It was a little temperamental and the menus/volume didn't always work, but it really is a minor point in such a lovely, welcoming home. Top marks across the board. Over the years we have rented other houses in York and although we have been satisfied with them all 14 Cloisters Walk is the best by far. We have now taken this beautiful and cosy house several times and look forward to many more visits. We have returned for several years now. Have always had a great time. The house is spotless, well equipped and convenient for the City. Dawn is a great hostess and the welcome pack gets better every year! This is our 2nd stay (my 3rd!) at Dawn’s “little house”, and it was as ever, absolutely wonderful. Warm and comfortable, with everything we needed, it was perfect accommodation in a perfect location. We’ve been coming to York for several years and this is by far the best place we’ve stayed in. Dawn remains a glorious hostess, and surpasses herself in everything she does to make our stay perfect. The welcome pack had to be seen to be believed...in fact I had to send a picture to my sister! We didn’t have to do much shopping, that’s for sure! Location excellent, property wonderful, and the welcome exceptional. Book it now! This end terrace house just outside Monks Bar is serviced and prepared with care. Two parking places are available (very much worth having in York!) and the house itself has everything you need for a self-catering stay. There is easy walking access to York city centre and all its sights, and also restaurants, takeaways and grocery stores (a big Sainsburys is next door). 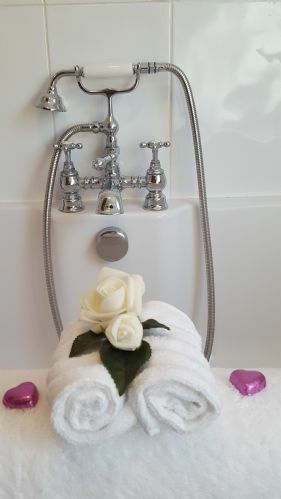 The accommodation was spotless, in excellent decorative order, with comfortable beds and fluffy towels in the bathroom, all superb. The welcome from the owner was exceptional - the "goody pack" prepared for us was a magnificent banquet of Yorkshire delicacies; not just the usual bread/milk/tea/coffee but also a bottle of Prosecco (OK not Yorkshire), a fabulous York Shambles butcher's Pork Pie, and crisps and confectionery among many many others. Also Welsh Cakes (hmm). We were made to feel truly welcome, shown around, given full info on the property and a "help" phone number if required. Such attention is truly above the norm. Mrs L, you are an exceptional hostess, thank you. The dining table only has three chairs which was OK for us, but the house does sleep four. The house backs on to the York inner ring road, and despite double glazing inevitably the delivery lorries at 6.00a.m intrude if you are in the back bedroom - not much at the front. These are niggle points. Bottom line: would we stay here again? ; would we recommend this accommodation to friends and family? ; Yes and Yes. Fabulous stay. Thank you so much Mrs L - you are a wonderful hostess. made very welcome.would love to make another visit.many thanks.xxxxxxxxxxxxxxxxxxxxxxxxxxxxxxxxxxxxxxxxxxxxxxxxxxxxxxxxxxxxxxxxxxxxxxxxxxxxxxxxxxxxxxxxxxxxxxxxxxxxxxxxxxxxxxxxxxxxxxxxxxxxxxxxxxxxxxxxxxxxxxxxxxxxxxxxxxxxxxxxxxxxxxxxxxxxxxxxxxxxxxxxxxxxxxxxxxxxxxxxxxxxxxxxxxxxxxxxxxxxxxxxxxxxxx. Second time staying at 14 Cloisters Walk.Prior to this visit had stayed in another in Cloisters Walk run by same company Inyork holidays as this was not free.This is by far best.Excellent host.Nothing too much trouble.Dawn even texted next day to ask if everything ok and to wish me happy birthday.Lovely touch(.Didn’t have any contact with owner in previous house so did feel isolated. 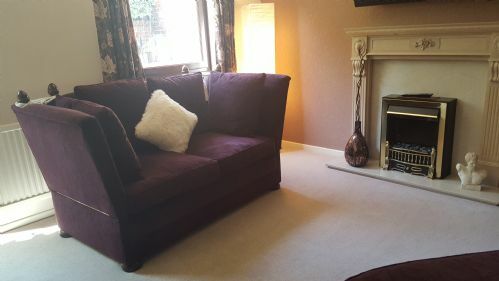 )Very well kept house everything you could wish for.The welcome pack was outstanding.Thought we might come home few pounds heavier as lemon cake was delicious but we soon walked it off around York.Great location with free parking. Friends on my return have enquired about this property as I was singing it’s praise. The house was perfect in all respects and the welcome we got from Dawn was really friendly. The welcome package was enough to keep us going for a good couple of days - and we even got to choose the type of cake !! “Thank you so very much indeed for your kind words and it is so lovely of you to take the time in submitting your Review. I try my very best to ensure that all my guests enjoy not only the wonderful delights that York has to offer but in addition to that I try to offer a welcoming “Home-from-Home” experience too (an experience which, in my opinion, simply wouldn’t be complete without a homemade lemon or chocolate or coffee & walnut cake). Thank you once again and I look forward to seeing you all again sometime in the not too distant future. My kindest regards, Dawn”. A very comfortable, immaculately clean and well-equipped property, with a welcome hamper that was in a league of its own! Great location, too - just outside the walls, and a very short walk from Sainsbury's, but still remarkably quiet. And a very warm welcome from the owner. Hope to stay here again. We received a warm welcome from our host who contacted us prior to our visit to confirm arrival time and answer any questions we might have. We were even asked if we would like a home-made lemon or chocolate cake.It was delicious as were all the 'goodies' left for us and great to have not only the essentials such as bread, croissant, milk, tea and coffee but also cake, strawberries and cream, fudge and wine. The house was immaculate and details such as the tablets for the washing machine and baking foil very thoughtful. There was ample outside furniture and it was good to relax in the little garden after a day out. The beds were really comfortable. Location was excellent as it was only a few minutes walk to the wall and to the restaurants, pubs,shops and many attractions of York centre. We had our latest break here in May. We have stayed numerous times before and we keep going back because of its excellent location and presentation. We are never disappointed. We were met with a big smile and warm welcome, even when we arrived late after a long journey. Dawn had put a bottle of bubbly in the fridge for us, there was tea, coffee, milk, bread, butter and jam, as well as nice treats like biscuits and a huge delicious chocolate cake! The location is one of the very best in York, so central but still resonably quiet considered it's a town centre location. Well equipped flat, with all you need. Sainsbury's supermarked is practically next door, so extremly handy for shopping! Lovely back and front yard, and great parking outside. We will most definitly come and stay again! Stylish, comfortable, super-clean, excellent location, and parking. 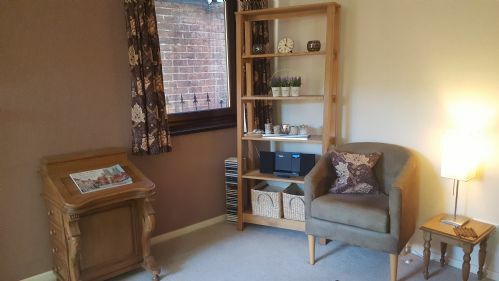 This house has everything you could hope for when looking for a place to stay in York. We have been to lots of properties over the years and enjoyed them all but Cloisters Walk is the best by far. Fabulous house, fabulous location, fabulous host! What more can we say oh yes fabulous selection of goodies provided. Dawn is an absolute gem as it was Valentines the house was decorated with red heart shaped garland and heart shaped chocolates. Already booked for November. 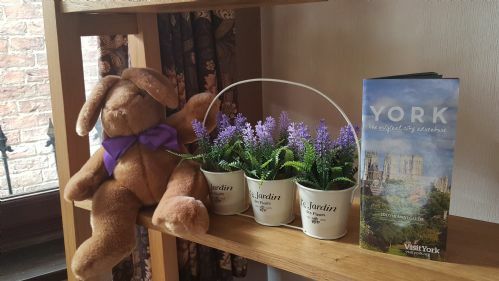 Could'nt ask for nicer place to stay,a short walk into the the wonderful city of York,14 Cloisters Walk is beautifully presented and is a credit to Dawn the owner,I would highly recommend this accommodation to anyone a real little gem. Ideal location, immaculately clean and well maintained property whose owners went out of their way to give a warm and friendly welcome. An amazing welcome pack of food awaited us which was lovely after a long journey, so no need of immediate shopping and we were particulrly pleased with the utilities provided in kitchen and bathroom. Excellent and we would like to return later in the year. We have been coming to this property now for several years and it is always wonderful. Everything is there that you need and the welcome pack gets better every year! The house is immaculate with Christmas decorations and everything. The owner (Dawn) is always there to greet us (or in this case to say goodbye) and is so bubbly and lovely. We look forward to our Christmas visit every year. Our favourite place to stay in York. The house has everything you need and is spotlessly clean. Close to centre and lots of fab restaurants. Sainsbury's is close by should you not want to eat out. Parking spaces a bonus. Fabulous warm welcome from the lovely Dawn and wonderful goodies and treats. Christmas decorations make it feel very homely. Have already booked another break. This property is our new favourite. We have stayed in several different properties in York and enjoyed them all but this one is our absolute favourite. 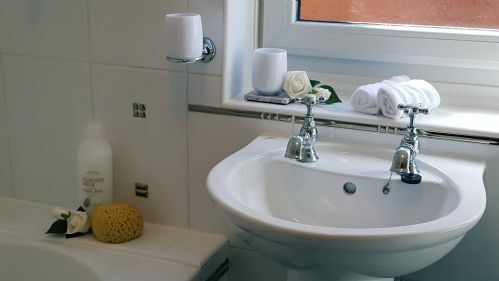 Located in a cul-de-sac only just outside the city walls and just a step from Sainsbury for supplies it is a very short distance to reach excellent restaurants and pubs, shops, and York Minster. The house is really comfortable and stylishly decorated with an attractive, walled patio with barbecue. It was a bit cool and it snowed while we were there so we didn't need the patio. The deal breaker for my husband is the off road parking for two cars. Dawn, the owner, welcomed us on our arrival and provided a very generous selection of essential, edible goodies. Delish! Thank you, Dawn, we'll be back. What can I say? 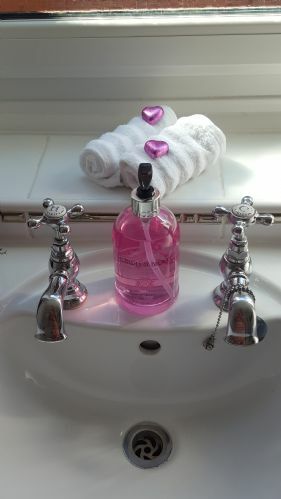 Dawn was so welcoming and accommodating, with all manner of thoughtful touches to make our stay so wonderful. Thanks for all the yummies Dawn! We’ve finally finished the lemon sponge! The house was lovely, clean, warm and comfortable. The location couldn’t be better. We loved being able to walk out every day in the beautiful city of York, with the Xmas lights and the Xmas Fair up and running. Sampling all the mulled wine stalls was good too! Many thanks for such a fantastic holiday. We look forward to coming back. Lovely, comfortable house in the most convenient location for everything York has to offer. Dawn is the best host and provides lots of treats and essentials to get your break off to a great start. Courtyard garden is a sun-trap even in autumn/winter and the car parking spaces are a welcome bonus too. We won’t stay anywhere else in York now. A phone call the day before we went, and a very friendly and thoughtful welcome from Dawn (who lived in the house for several years and obviously loves making it a special stay for guests), set us up for the holiday and made us feel at home. A really nice welcome pack including basics in the fridge and lots of special touches, being able to park our car earlier in the day, and the house very clean, pleasant and comfortable. Just outside the city walls meant we hardly needed to get the car out all week, and very convenient for Sainsbury's. Altogether a really comfortable relaxing stay and one we would happily repeat if we stay in York again. The little house is a gem! It offers everything one can wish for. The location is perfect and the landlady simply lovely! We will definitely come back! Thank you for an unforgettable week! Superb accommodation near to the centre of York. Easily the best we've ever stayed in. A genuine home from home! A perfect house in a perfect location. Parking was an added bonus as was the proximity of Sainsburys. Dawn, the owner was lovely and made sure everything was perfect and we would want for nothing. Simply could not have found a better place to stay in York. Dawn is a fantastic host , very friendly and very welcoming. We even had a goody bag of food on our arrival, which we did not expect, and Dawn was there to greet us. The house was, well, lovely. We could not find anything to criticise. well furnished, well maintained, and obviously well loved. 2 minutes from Sainsbury's, 5 minutes from the Minster, 10 minutes from the Shambles and 15 to 20 minutes from the National Railway Museum. What more could you want? We have stayed here many times and we keep coming back because it's a great property in a brilliant location and it's good value. This property is perfectly placed for discovering the wonderful city of York,just a short walk from the Minster and close to all the major visitor attractions, the property is well maintained and has everything you would want for a stay in York, Dawn (the owner) was waiting to greet us and to make sure we knew were everything was, hidden from view across the road is a Sainsburys, which is very handy, I would highly recommend 14 Cloisters Walk. Die Unterkunft ist geschmackvoll und gemütlich eingerichtet - ein absoluter Wohlfühlfaktor. Auch der Empfang durch die Eigentümerin war äußerst herzlich. Ich kam Sonntag Abend an und sie hatte extra den Kühlschrank für mich gefüllt!!! So etwas habe ich in diesem Ausmaß noch nie erlebt. Die Wohnung liegt sehr zentral, gleich außerhalb des Stadttores "Monk Bar". Von dort kann man auf der Stadtmauer spazieren und dabei das Minster halb umrunden. De Wohnung hat zwei völlig gleichwertige Schlafzimmer in der 1. Etage und ein gemütliches Wohnzimmer im EG. Wunderbar ist auch der schöne Innenhof. Selbst im März habe ich ihn bei Sonnenschein genossen. We would recommend this property as one of the best we have stayed in York ideal for access to the City and surrounding areas. Wonderful property, Dawn the owner is great, nothing too much trouble. We were overwhelmed by the lovely extra's she provided. It was great. Wow, this place was amazing! Loved, loved, loved this place! The apartment was immaculate and the owner had all kinds of special little food items, bath items, etc.. ready for us. The location is perfect, right across from the walled city. You can see the Minster from the back window. There is a grocery store right across the parking lot. We walked to everything right from the apartment. We were on a two week trip staying in VRBO's and this one was our favorite! What a fantastic start to our holiday , our host Dawn had thoughtfully provided a fabulous hamper of goodies , even though there is a supermarket within walking distance . The property was 2 minutes away from York centre which meant no driving so the car was left in the private parking space next to the property. The property itself was in excellent condition with a beautiful courtyard . Dawn made it clear that we could contact her for anything if needed . A beautiful house in a good location we will definitely be returning . My 3rd time at this property and it's now the only place I want to stay when visiting York. Lovely house in perfect location with everything in walking distance. Parking space a bonus if you bring your car for trips further afield. Great house, best we have stayed in for many years( and we have had some awful ones).Terrific host, nothing too much trouble.Welcome pack unexpected but was liked by all and did save us rushing out to buy basics.Location perfect.Nice to leave car and wander into York City Centre.We like this so much that we aim to come back, if Dawn will have us.My husbands colleagues have also been enquiring about website so they can book as he has told them how lovely it was. This was our 3rd holiday in York and this property was the best we have stayed in. It overlooks the city walls and is very handy for all the attractions in the city. We had a lovely warm welcome from the owner Dawn who keeps the property spotlessly clean. She also provided a very generous welcome pack, including bread, milk, butter and cake! What more could you ask for! There is also a lovely garden with chairs and loungers to sit out in if the weather is good. I would highly recommend this holiday home and would love to return and stay here again. We have stayed in this property numerous times. We always look forward to going back and it never disappoints. The owner is delightful and gives us a lovely warm welcome. The house is always in pristine condition and it's very well equipped. It's only a short walk to the town centre and all York attractions. We had a great time at 14 Cloisters Walk. The owner, Dawn, was lovely and had left us an amazing Welcome Pack. The house was so convenient for all the sights in York and we hope to be back again one day. upon arrival we received a really warm welcome with an excellent welcome pack. The property is very conveniently situated with a view of the walls and is a real home from home. York is full of interesting places to visit and restaurants of every description, an excellent holiday. We loved our stay and will definitely come back if we visit York again. Great location, lovely little extras (thanks for the Easter treats!) and spotlessly clean. It was brilliant to be able to park the car in the city centre to visit all the museums with the children, plus the Sainsburys over the road was very handy. Dawn was so friendly and was very flexible with arrival and departure times. Perfectly wonderful. This house has been a great find. Parking for two cars, a couple of minutes stroll to Monkgate and the fabulous city of York awaits. In a very quiet residential area despite the close proximity to the city. Very warm and cozy, equipped with everything you could possibly need. Wonderful garden area with seating and barbecue, which would be lovely in the warm weather. A wonderful warm welcome from the owner Mrs Lacy, who is very helpful & nothing is too much trouble. An extra special touch is the amazing welcome pack which was very much appreciated. We can't recommend this accommodation enough. Hope to return very soon. Thank you. It is a fantastic stay in Dawn's lovely and cosy home. Good location, nice view, and the little beautiful rear courtyard is another bonus. Dawn took good care of every details of the house and you will get nearly everything you need or even timely assistance from her. Thank you too for the welcome treats. York is a lovely city and here is sure a great place to start your exploration! Enjoy! Sixth return says it all, best place in all york, just love it.Dawn, the owner, best greeting on the planet.Superb accommodation. Simply the best!! Dawn, the owner, met us and showed us around, she had tastefully decorated the house for Christmas and left us lots of goodies to enjoy , her attention to detail was great. Dawn was very attentive especially during the floods which York had over that period. The house was not in any danger from the floods but Dawn still came to make sure that we ok. The house itself was warm and comfortable, it is close to town - just a 10mins walk through Monkbar. We cannot recommend this house enough and would stay in again in an instant. This is one of the best houses we have ever stayed in. Perfect house in a perfect location, within walking distance of all amenities. Car parking space is a real bonus when renting a city centre property. Dawn the owner is an absolute gem a pleasure to meet every time we stay there. An excellent stay again. The house was spotless and well equipped. The welcome was like old friends coming back. We will be back again next year for our annual Christmas shopping trip. The house is warm and welcoming, so comfortable. Dawn very kindly provides a fantastic welcome pack so no need to go shopping. A few minutes stroll and you are in the heart of York. We have been many times and hope to go again next year. A fantastic holiday home, with everything York has to offer within walking distance. Home from home amenities and lovely wee courtyard garden is perfect to relax in on a nice day. We had a lovely welcome to the property from Dawn the owner and the welcome pack she left us was full of treats which was a nice surprise. The house is comfortable, warm and well equipped and is only a few minutes walk from all of York's atactions. We would definitely stay there again if we have another holiday in York. A clean,comfortable and convenient accommodation in York .The owner was very helpful and the welcome pack very generous! We really relaxed hear and hope to stay again. If you need to stay in York this house is perfect. We have stayed here on several occasions and just love it. House is great and the garden is nice for sitting out in. Would give 5 stars as we have no complaints. The owner is lovely making you feel welcome and spoils you rotten. Very good property in an excellent location for sites and shops. A clean and tidy house with almost no downside except maybe the front bedroom a little noises. Very welcoming and extremely clean and tidy. Everything you could possibly need for a stay away. We thoroughly enjoyed our stay in York and the location and condition of the property was outstanding. A few minutes walk from York Minster and the centre along with easy access to other places. Private parking right outside was great too. A simply superb place to stay in a beautiful city. Can highly recommend 14 Cloisters Walk - easily the best self-catering accommodation we've ever stayed in! This property is in an excellent location for exploring York, very close to York minster and the city centre. Lots of lovely pubs and restaurants within a few minutes walk. The Sainsbury's supermarket is a 2 minute walk away, very handy! 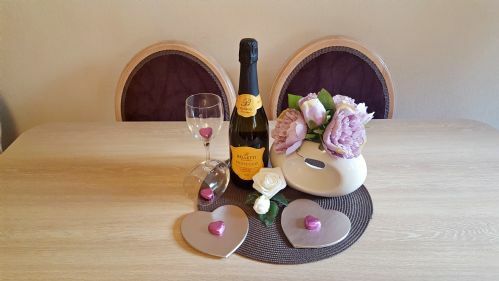 The property itself is in excellent condition, the chairs and beds are very comfortable and good quality bed linen too. The garden area is really nice and very secluded. The house also has excellent security. The owner Dawn Lacey makes you feel so welcome, the welcome pack is unlike any other! she really does go above and beyond! possibly the best self catering experience we have ever had. Look no further for clean and comfy accommodation near York city centre. This house would be hard to beat. Only a few minutes walk from York Minster and other attractions and a real home from home. Will definitely go back. Booking through Inyork holidays was really easy and quick, they responded very quickly to queries and put us in touch directly with the owner of the property. This is a great place to stay, just right next to the York city walls it's so close to everything and there is a supermarket just across the street for everything you might need. I stayed here with two friends for four nights and it was a great size for the three of us and had everything we needed. Dawn the owner was fabulous, she was there to meet us when we arrived and gave us loads of helpful tips about the place and about the city, made us feel right at home and even left us some biscuits and cake when we arrived! There was no problem changing our arrival time and she was really accommodating and easy to get in touch with before and during our stay. The house was super clean and really nicely decorated. There is private parking for two cars which was great as finding parking in York can be very difficult. Overall just a great place to stay and I would definitely stay here again! We were pleasantly surprised to find that our rental apartment was, in fact, a lovely 2-bedroomed town house. Already knew about the beautiful courtyard garden at the back. Never been in any place so well-equipped. The landlady, Dawn Lacey, has a great flair for interior - and exterior - decorating. She was very friendly and welcoming. We would highly recommend this rental. Cannot fault the property at all - best self-catering accommodation we have ever stayed in ! And the owner is so helpful and friendly! Just excellent and we'll be back ! Perfect pad in perfect place. Ideally located house, offering very comfotable accommodation. Very convenient for the Minster, central shops and restaurants. So handy to be able to do a little shopping, have lunch, then pop back to the house with parcels before visiting a museum/gallery in the afternoon. Two parking spaces in central York a real bonus. Dawn, the owner ,is very friendly and helpful. 14 Cloisters Walk is the best self catering accommodation we have ever stayed in. The house is immaculate, superbly presented, has everything you could possibly need and more and is in a superb location. Upon arrival the owners meets you and is one of the nicest people you could ever wish to meet and always leaves a lovely welcome pack. A pleasure to return to this property again and again. Have been twice before and will be definitely be going back. Owner is extremely friendly and helpful. 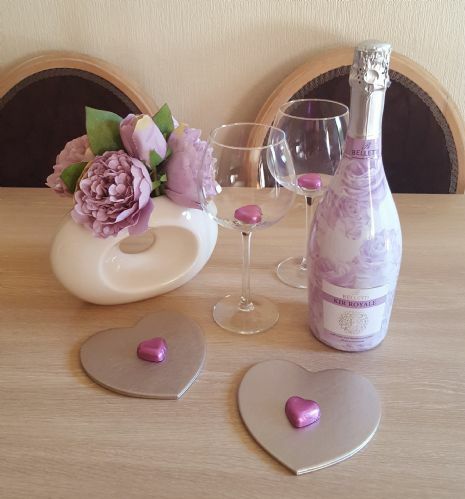 The house is always spotless and well furnished and the welcome pack is always grand. It is very handy for the purpose of our annual visit to York - Christmas shopping! Love it. Excellent place to stay clean and comfortable. Very close to the centre of York so handy for returning during the day. great holiday would come again. Fabulous house near centre of York. 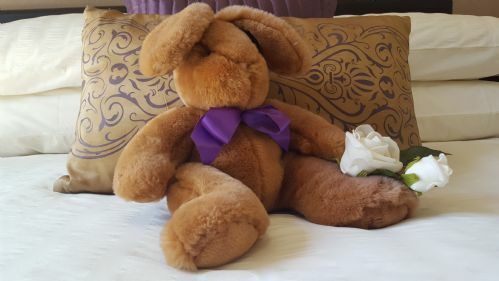 The owner provides all the little touches that make your stay exceptional. Warm and welcoming. We arrived near Christmas time and had crackers on the beds. Parking space which is a premium in York. This was the 2nd time we have stayed in this lovely comfortable house. Dawn the owner is such a friendly person you feel like you have known her forever. Would highly recommend a stay here. We will be back next year.